Charlotte Wilhelm was educated at the Lette-Verein in Berlin. In 1925 she married the aircraft designer Adolf Rohrbach. She was active as a photographer of industry and architecture. She was best known for her photographs of the works of Arno Breker. Her husband died in 1939. After the Second World War she worked for Film und Frau and for A&W Architektur & Wohnen. She died in 1981 and was buried in the grave of her husband at the Südwestfriedhof in Stahnsdorf. The grave of Adolf Rohrbach at the Südwestfriedhof, Stahnsdorf, Berlin. 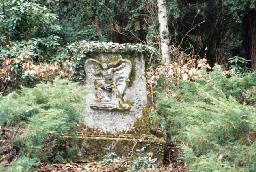 Sculpture by Arno Breker at the grave of Adolf Rohrbach at the Südwestfriedhof, Stahnsdorf, Berlin.